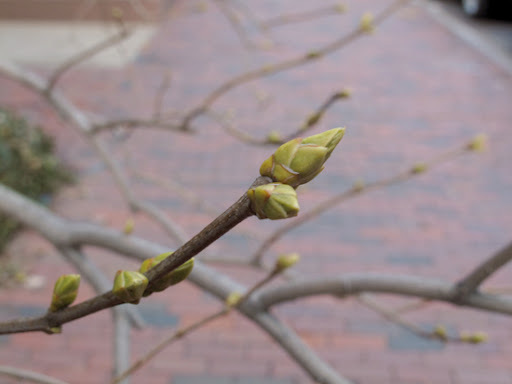 Not only are there buds on trees but I took the photo of this bud after 5pm - and it wasn't completely dark. If I could make spring myself - I might - but then again, I just might not. Boston winters have taught me patience. But the extra light and these little buds are exciting - something is on the horizon. Soon the sidewalks will be trashed with petals, seating will spill out of cafes onto the sidewalks, faces will be up instead of down, protected from the wind, and no one will miss a beat. And that's good because the natives are getting restless. I have a big day tomorrow, that's why this post is so short, and indeed, I've had a crazy challenging overwhelming busy number of months recently - but Spring is coming! And there is no place like Boston in the Spring, don't even get me started.